Pickleball is a racket sport in which two to four players use solid paddles made of wood or composite materials to hit a polymer perforated ball over a net. The sport shares features of other racket sports, the dimensions and layout of a Badminton court, and a net and rules similar to tennis with a few modifications. One of the fastest growing sports in North America, Pickleball was invented in the mid 1960s as a children's backyard pastime but quickly became popular among adults as a game fun for players of all skill levels. 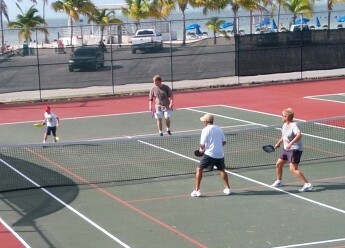 The pickleball court is similar to a doubles badminton court. The actual size of the court is 20×44 feet for both doubles and singles. The net is hung at 36 inches on the ends, and 34 inches in the middle. The court is striped like a tennis court, with no alleys; but the outer courts, and not the inner courts, are divided in half by service lines. 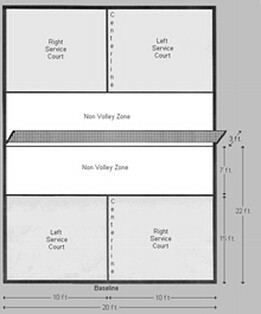 The inner courts are non-volley zones and extend 7 feet from the net on either side. The ball is served underhand from behind the baseline, diagonally to the opponent’s service zone. Points are scored by the serving side only and occur when the opponent faults (fails to return the ball, hits ball out of bounds, steps into the 'kitchen' area [the first seven feet from the net, also known as the non-volley zone] in the act of volleying the ball, etc.). A player may enter the non-volley zone to play a ball that bounces, and may stay there to play balls that bounce. The player must exit the non-volley zone before playing a volley. The first side scoring 11 points and leading by at least two points wins. • Crosscourt — The opponent's court diagonally opposite yours. • Half-volley - A type of hit where the player hits the ball immediately after it has bounced in an almost scoop-like fashion. • Non-volley zone — A seven-foot area adjacent to the net within which you may not volley the ball. The non-volley zone includes all lines around it. :A-4 Also called the "kitchen"
• Poach — In doubles, to cross over into your partner's area to play a ball. • Server number — When playing doubles, either “1” or “2,” depending on whether you are the first or second server for your side. This number is appended to the score when it is called. As in, the score is now 4 - 2 - second server.